Social media have recently brought different opportunities, and challenges, to E-mobilization, E-tactics, and E-movements. Here’s an insightful account by Rasha A. Abdulla, associate professor in the department of Journalism and Mass Communication at the American University in Cairo: ‘The Revolution Will Be Tweeted‘. Read her account of Egyptian Spring! Movements have gone global because of digital media. Arguably, the Occupy Movement, for example, has used an interesting mix of communicative tools and media, from hand gestures to online and mobile organizing — but certainly spread around the world because of social media. (Here’s a fascinating account of the birth of the movement). As we know, Occupy Sandy broadened the movement from protesting to doing hands-on disaster relief work. It also spurred a collaborative documentary project. But, sometimes, digital platforms are not only tools for democracy, but tools for surveillance by non-democratic regimes (as Evgeny Morozov notes). And Personal Democracy Media, an organization of practitioners, scholars, activist, policy-makers already mentioned earllier, offers great video lectures on Net Policy & Activism. The videos showcase how important media policy-making has become in terms of democracy (and possibilities of community-building), and how it thus become a great interest to media-focused activism. Yet, there are also are those who wouldn’t be interested in participating in global deliberations, but who use direct digital actions to make their voices heard; those whom some call cyber-terrorists, others hails as freedom fighters: The Anonymous and other hacktivist groups. Here’s a great article by the anthropologist Gabriella Coleman on the nature of the Anonymous as a community — “Our Weirdness is Free”. And here’s a Wikipedia timeline on the activism of The Anonymous. We are screening this movie because it describes the birth and development of an online community of dissidents (helpers? or criminals? Opinions on that differ.) While today’s assignment is about the ethics of communities, do pay attention to the nature of the community. How does it function? Who leads it? What is the relationship between on- and offline activities? Please read the aforementioned article by the Coleman on the Anonymous — “Our Weirdness is Free”. And check out the Wikipedia timeline on the activism of The Anonymous. 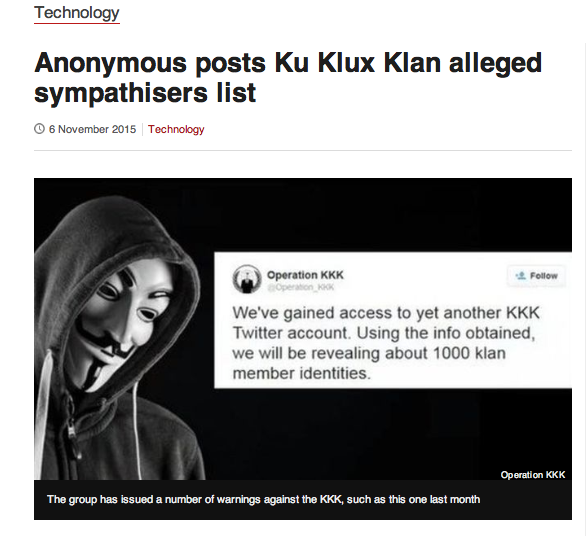 Read also this recent news article on the Anon and the KKK. And, please check out the reading “Handbook for Cyber Dissidents” on Dropbox – practical advise on blogging for those who want to have an impact. It also has a great short section on ethics. Your task: To create a BLOG post either for or against hackers like the Anonymous. Please consider this seriously, as we are living in ambiguous times, legally as well as ethically-morally: Based on your readings for this session, do we need civil society groups such as the Anon to act as watchdogs, and even as those who implement punishments for wrongdoings? Should there be a universal code of conduct for online communities — rights and responsibilities, a bit like the UN Universal Declaration of Human Rights. If you were to name 2 main rights and 2 main responsibilities, what would they be? And what kind of (global) body could monitor compliance to those rules? Include one or some of these issues in your blog post. Post your thoughts below as a comment. Be patient: if you are commenting here for the first time, as most of you are, I need to approve you and your comment. I might not be online exactly when you post, so you might not see your text immediately. Please note that you can use any name you want when commenting, to maintain anonymity. But, please, use your SJU email as your contact email in the comment so that I can identify you (only I see the email address). Or, if you have your own blog, or you wish to create a blog, and want to post this assignment there, please do so (bonus!) You can use any blogging platform, (Tumblr, Medium, etc…). If you decide to do that, just post the link to your blog below (or on Facebook, if you don’t want the link to be public via this post).